This lemon mini parfait is a perfect dessert. It’s light, it’s lemony, it’s naturally sweet, and it’s just enough! Sometimes all you need for dessert is just a taste. This lemon mini parfait will likely leave you wanting more, however, as it is so good! 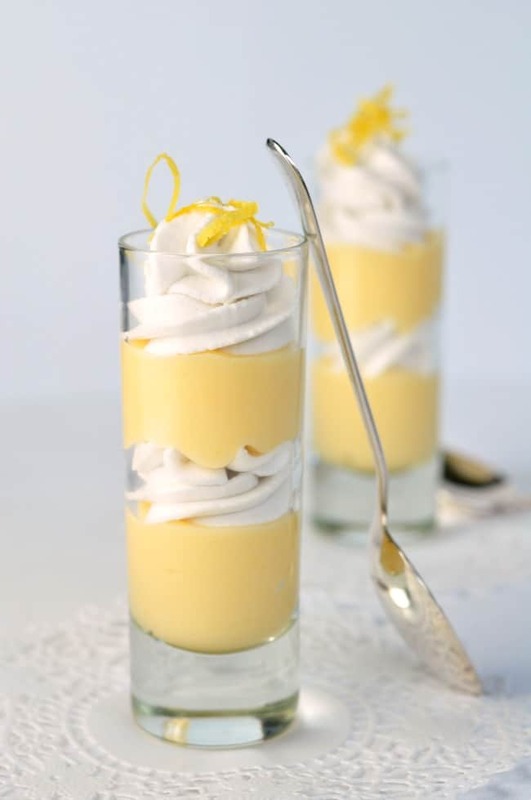 Layer tangy, naturally sweet Meyer Lemon Curd with whipped coconut milk in a shooter glass and . . . that’s it! Done. 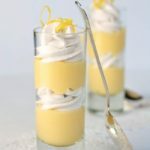 While Meyer lemons have a wonderfully intense flavour, any lemons will work beautifully in this easy shot glass dessert. I’ve made this successfully with both types of lemon several times. 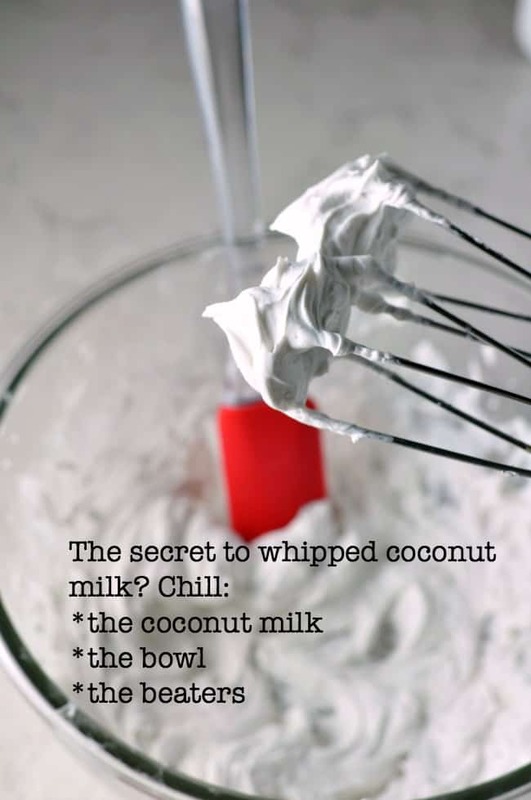 Whipped coconut milk is delicious and provides an alternative for those who are following a dairy-free or paleo diet. It can sometimes be a little difficult to get it to whip. I’ve discovered some techniques to get it to whip successfully. 1. When you buy coconut milk, put it directly into your refrigerator. That way you’ll always have a can ready. 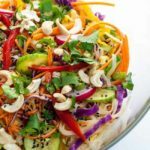 Make sure it is full-fat coconut milk, not the light version. 2. Choose a brand that ONLY contains coconut and water. 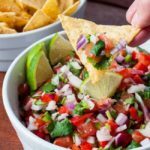 Those that have emulsifiers (like guar gum or carrageenan) or thickeners (like corn starch or methyl cellulose), or preservatives and whiteners, (like sodium or potassium metabisulphite) are less likely to whip. 3. The can must be refrigerated for 24 hours or more to allow the solid portion to harden completely. 4. Chill your mixing bowl. Pop it in the refrigerator for 10 – 15 minutes before beating. To make this dessert, you will need to prepare the lemon curd first. Find my recipe and instructions for how to make Paleo Lemon Curd here. This Lemon Tart with Blueberries made with lemon curd and whipped coconut milk is fabulous too! 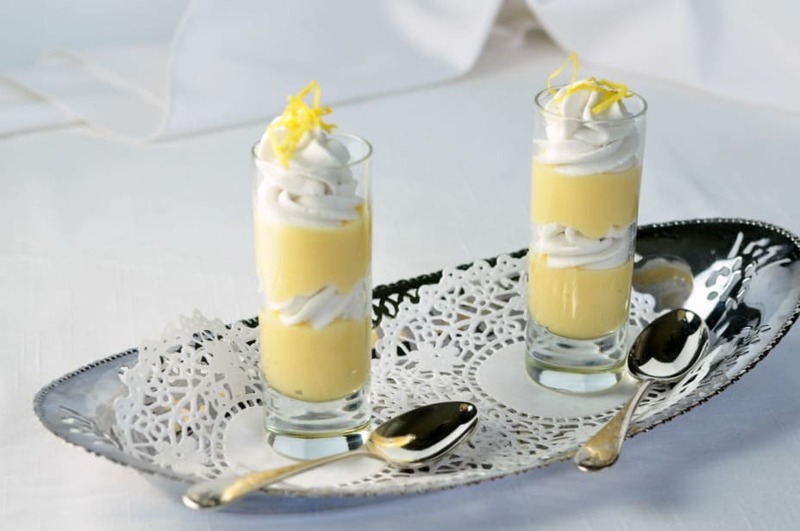 This spectacular Meyer Lemon Mini Parfait shooter dessert is made with lemons, coconut milk and honey. Chill a medium mixing bowl and the beaters for your electric mixer. Beat on high speed until doubled in volume, scraping the sides of the bowl frequently. Add the vanilla and sweetener and beat for one minute longer. Chill. To assemble, use two cake decorating bags fitted with decorating tips. Fill one with homemade lemon curd and the other with the whipped coconut milk. Alternate the layers in shooter glasses, finishing with whipped coconut milk. 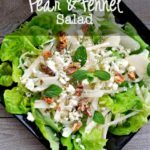 Garnish with a little lemon zest and chill or serve immediately. This post contains affiliate links through amazon.com. If you purchase something through my site, I receive a small commission, paid by Amazon, not by you. It helps to offset the cost of maintaining my site. Thanks for supporting Flavour & Savour! Nossa essa receita e perfeita, para se deliciar em um domingo junto com toda família. obrigada por essa maravilha de receita. Enjoy your Sunday dinner with your family! Oh, how disappointing! I feel your pain 🙂 I have found this to sometimes be frustrating, too. Some cans turn out perfectly, others don’t. After much experimentation I’ve found that the brands that work best are the ones that ONLY contain coconut and water. 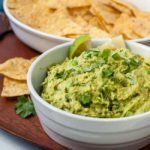 Those that have emulsifiers (like guar gum or carrageenan) or thickeners (like corn starch or methyl cellulose), or preservatives and whiteners, (like sodium or potassium metabisulphite) are less likely to work. Thanks for commenting. I’m adding this to the other instructions above.